Here's a sneak preview of the cover of the book. The designer recently sent a picture---I'm just giving you a preview as it's a secret, you know. 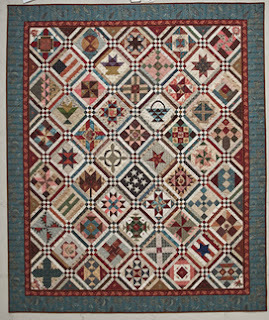 It'll be called Barbara Brackman's Civil War Sampler but it should be Barbara and Becky's Civil War Sampler---as it's Becky's quilt up there. machine quilted by Deb Jacobs, 2011. You'll recognize the blocks from the many posts in 2011. 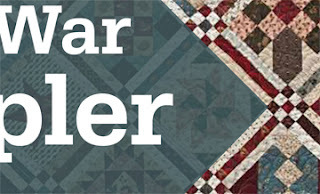 The book will be shown to shop owners at fall 2012 quilt market. It will be in shops December 2012. Just in time to make it onto your Christmas list. Great choice for the cover. A beautiful quilt! Oh this is fabulous! Love it. What an awesome quilt! It's perfect for the cover. How exciting for you to see this sneak preview. How perfect to put Becky's quilt on the cover. You both did an amazing job of leading us through the blocks each week. It was a wonderful and unique experience, both in gaining skills and friendships, both real life and cyber space, I shall look forward to the book release. How exciting! I should rename my quilt "Friendship Quilt" - Thanks to everyone who made this project so much fun by sharing your blocks and comments. I can't wait to see what Barbara has tucked inside the book. Happy sewing, everyone. 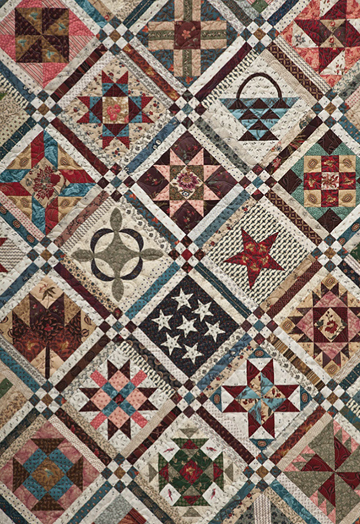 Becky did a beautiful job on the quilt, love the fabrics and beautiful piecing. I got the civil war woman book, so today i will work up a block and see how I do. Lovely cover quilt, I know this book will be on my list this year. It will be fun to see some of my blogger friends blocks included in the book. This will be on my xmas wish list. Love the setting for the blocks. You have both done a wonderful job. Happy International Quilting Day! I cannot wait for this book! Congratulations to Becky on her awesome quilt and front cover! This has been the best group ever and I thank you Barbara for getting us so inspired week after week! Planning on buying several copies!! Oh, this is a wonderful tease! Congratulations to Barbara - I can hardly wait to get the book - and to Becky - it is absolutely perfect to have her quilt on the cover! It was a wonderful experience in all ways! Looks fantastic! What a treat! So exciting - Becky is a CoverGirl. It is going to be wonderful, and I can't wait to turn the pages. This will be a wonderful Christmas gift! Barbara, thanks for sharing all you do. Becky, you did a fabulous job and your quilt has a well deserved place of honor as the cover quilt! This is one book I can't wait to get! The book cover is beautiful and I can't wait to look inside, congratulations Becky on being a cover girl and thank you Barbara for such a fun project that I am slowly catching up and will someday finish! 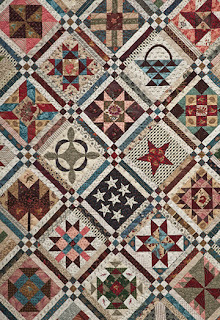 This would have to be one of the most anticipated quilting history books for a long time Barbara!!! Of course you know that you already have a wide captive audience of dedicated quilt hisory lovers don't you LOL!!!!! Thankyou for that little tease peek of the cover, it'll be awesome and I can't believe it'll be available at the end of the year, can't wait!!!! Thank you so much for putting it into book form. All my printouts are getting messy. I'll be online ordering it the day it comes out! Very lovely quilt and the cover will look wonderful.Congratulations to you both. Do you ever get a list of what fabrics or colors people use. The gray sashing one is lovely.